I knew Poweroft amplifiers from other installations, and of course the quality is great. My experience with the new Deva product is exactly what you would expect from Powersoft. Professional audio manufacturer Powersoft announced that its revolutionary Deva two-way messaging system has been integrated three city blocks at the heart of downtown Thomasville, Georgia: a classic and historic 'Downtown, USA' location that required a comprehensive entertainment, information and messaging solution for its 'Victorian Christmas' event that took place in December. S&L Integrated, LLC, based out of Thomasville, Georgia, specified Deva for the project for its powerful content delivery features, ease of integration and usability. The catalyst for the installation was 'Victorian Christmas' — an annual three-day event in the city center that hoists the holiday spirits of both residents and tourists alike. The City Council wanted to be able to play holiday music along the core three blocks of its Main Street to enhance the Christmas shopping experience for visitors, as well as program announcements and handle control of the units from a centralized location. Most of all, the City didn't want to have to rip up its sidewalks, or create any unwanted physical disruption of its historic downtown environment — therefore the solution had to be wireless. Enter Deva — which fit the tall bill of requirements exactly, and is also set to create a path for future integrations that may occur down the road: "Thomasville has done a great job of being a leader in their downtown development in the state of Georgia," said Jason Jones, President of S&L Integrated. "When we looked at the city's needs, which were nothing short of visionary, Deva was exactly what I was looking for. Frankly, there was nothing else like it on the market." The project started with the city's administrator, Karen Smith, Executive Director of Main Street and Tourism, who gave Jones a call explaining that she wanted to "put some music downtown to enhance the shopping experience for people." he says. "The problem was since the city is historic and the sidewalks are old, we were unable to run any of the wires through the buildings or underneath the sidewalks. I spoke to my rep at Powersoft and he recommended the Deva wireless system — so we took that route and piggy-backed off of the city's wi-fi." "With this product, the city can now realize its music needs, and is able to push out information on special events and other announcements," he continues. "There are many more capabilities Deva offers — such as video capture — that the city hopes to take advantage of in the near future." Though he had never worked with the product before, Jones had already been familiar with the Powersoft brand itself: "I knew Poweroft amplifiers from other installations, and of course the quality is great. My experience with the new Deva product is exactly what you would expect from Powersoft." During the equipment selection process, Jones reports that first impressions by the City Council were favorable for Deva: "Powersoft provided us with a demo unit that we were able to test," says Jones. "The networking team for the City got behind and said it would be great for what we were looking to accomplish. A major selling point for us was the cost savings on labor — both for the installation itself, which didn't have to involve wiring, as well as the fact that we didn't have to rip up and replace the sidewalks. Deva allowed us to retain the historical context of the city without any disruption." 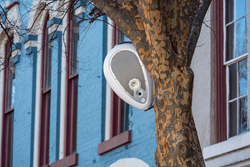 Each of the Deva units — 20 in total — were mounted discreetly in trees lining each side of Main Street, positioned approximately 20 yards apart from one another. "Installation was easy," recalls Jones. "As soon as we got each of the Deva units up in the trees, the City helped us with setting up their Wi-Fi." S&L Integrated Systems used adjustable strapping to secure each of the rugged, outdoor-rated Deva units in the trees. In terms of power consumption, the City was able to run all of the Deva units off of a 20 amp circuit, using the same outlets that were used to power the lighting in the trees. As far as the audio performance is concerned, Deva has delivered: "They sound great," says Jones. "The coverage pattern is very wide, so we are able to cover a good bit of the streetscape. Each Deva is pointed towards the other side of the street, so they are blanketing the entire road as well as the sidewalks on the opposite sides." Thomasville's Victorian Christmas has clearly leveraged many of the benefits of Deva, there are many features that have not been in use, yet may be implemented in the future. For example, Deva's solar panel capabilities, its lighting and video capabilities and remote monitoring features — which could be managed from the City's own data center via Powersoft's customizable software. This year's Thomasville's Victorian Christmas was once again a hit — and the Christmas music the City was able to help create a festive ambiance among holiday shoppers. Feedback among those attending was favorable: "Guests of the Thomasville Victorian Christmas said that they enjoyed Christmas music being played, and how much this added to the spirit and the mood of the event," Jones says. The system was also nimble, enabling certain Deva units to shut down to accommodate street performers, he says: "There are many street performers who play from time to time, and all of these are scheduled. By using the software that came with Deva, were able to program the times these people would be performing and turn off the pre-programmed music at the locations as needed." Currently, the City is building an amphitheater downtown, and Jones says that the Deva network might be expanded: "The plan is to expand this system to the amphitheater, which is another six or eight blocks away," he explains. "It is a huge benefit that this system is expandable, and will stretch as far as the city’s network can handle. Each unit is self-contained and everything can be programmed through the network. All of this is simple to control with the software."